The Waco A series is a range of light American-built twin side-by-side seater sporting biplanes of the early 1930s. 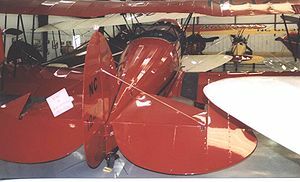 The Waco A series was introduced in 1932 as an affordable private-owner aircraft with cross-country range and baggage capacity and a more sporting image than the larger Waco F series. The A series offered a number of engine options which had varying sub-designations. The power range lay between the KBA with a 100 hp (75 kW) Kinner engine and the later UBA with a 210 hp (157 kW) Continental powerplant. The PLA "Sportsman" of 1933 introduced a longer wider fuselage and a higher useful load and had a 170 hp (127 kW) Jacobs LA-1 radial engine. The last model in the series was the ULA, also of 1933, with a 210 hp (157 kW) powerplant. The A series was bought mainly by private pilot owners with a sporting inclination. Relatively few were produced and the type survives in small numbers in 2009. A PBA is on display in the Historic Aircraft Restoration Museum at Dauster Field near St Louis, Missouri. Green, William (1965). The Aircraft of the World. Macdonald & Co. (Publishers) Ltd. ISBN none.